This was the second year FSI was held at the Sheraton Centre in downtown Montreal. It was also the second year under the stewardship of industry veteran Michel Plante. The wide range of participating exhibitors suggests that the new leadership believes the future of audio shows, particularly in Canada, relies on embracing all home entertainment, be it audio, home theatre, photography, game consoles or related items. While I am a hard-core two channel audio guy, I recognize that in a small market like Canada, dedicated audio shows have limited reach and sustainability. If the average Joe and Jane are attracted by flat screen TVs and iPods, perhaps they might have a listen to some decent hifi as well. Furthermore, I can't think of a more effective way to lure young people to audio than by including the gaming community at shows. It worked for my 13-year old son Patrick who accompanied me this year. He was predominantly attracted by the gaming gear -- not to mention a day off school -- but he thoroughly enjoyed listening to audio equipment when he tired of mowing down bad guys on 72" flat screen plasma monitors. Considering that FSI is the only major consumer electronics show in Canada, I believe that offering a comprehensive and inclusive environment is a wise strategy. Having a show as well run and organized as this can only help the industry. When covering shows, I usually refrain from commenting negatively on the sound of each room as conditions are hardly ideal for critical listening. The real fun for me is chatting with exhibitors and fellow listeners such as the very enthusiastic Spirit from the newly formed Toronto Area Audiophile Society. My only regret was not being able to spend more time schmoozing. The most impressive aspect of this year's show was observing my son as we went from room to room. He recognized the varying sonic presentations, he asked questions of the manufacturers/dealers and he certainly had an opinion on each room. I could see his eyes light up when it dawned on him what it was that attracts audiofools like his old man to hifi especially when he heard his favorite Green Day tunes on a decent rig. While we didn't get to every room, Patrick had two distinct favorites. 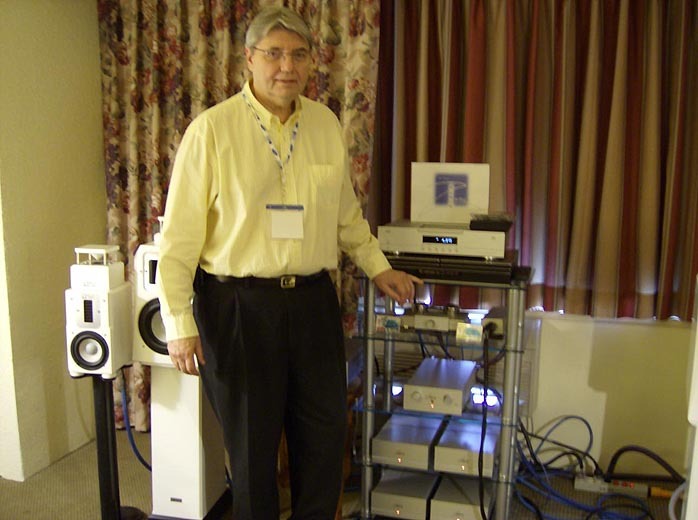 He enjoyed the Art Audio/Hudson Audio room which featured Bluenote's highly regarded Stibbert 2 CD Player ($5,000), Scheu-Analog Das Laufwerk turntable ($5,995) with Schroeder Model 2 tonearm ($2,450) with Allaerts ECO cartridge ($2,000), Scheu-Analog Cantus 12-inch tonearm ($1,400) and Dynavector 20x low output cartridge ($580). Speakers were FJ OM ($3,995) or Dude 2 ($5,795). 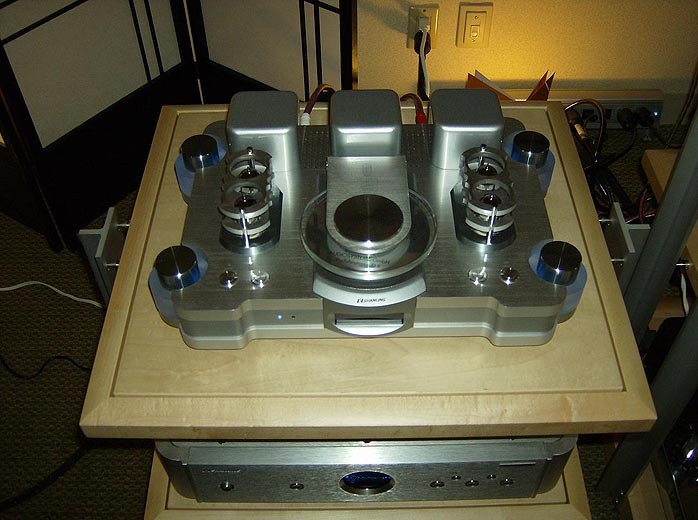 The unusual FJ OM places its woofer on the top of the cabinet. 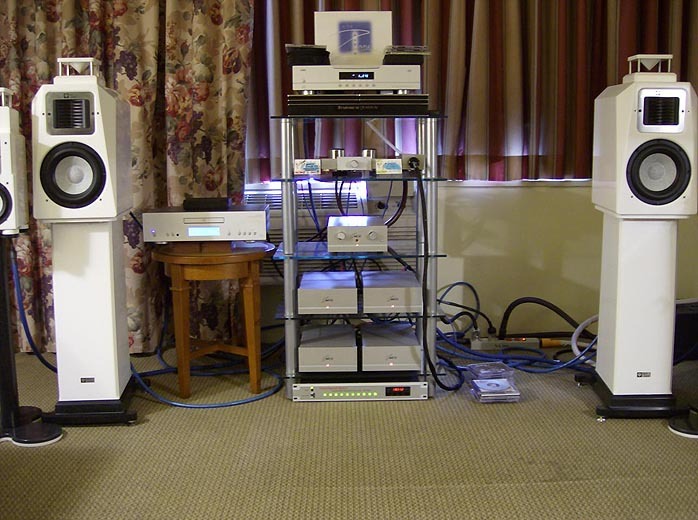 Also in this system were the Gill Audio Vinyl One ($4,500) phono pre, Gill Audio Alana line stage ($4,500) and Art Audio Quartet monos with 845s run in push-pull ($13,000/pr). Racks and platforms were all Symposium. Whew, whatta rig. Patrick was quite taken with the upward firing OMs and commented that "they made the music come from all around me instead of straight from the front of the room". Patrick opined, "The music sounded great. It filled the room and felt like it was wrapped around me. 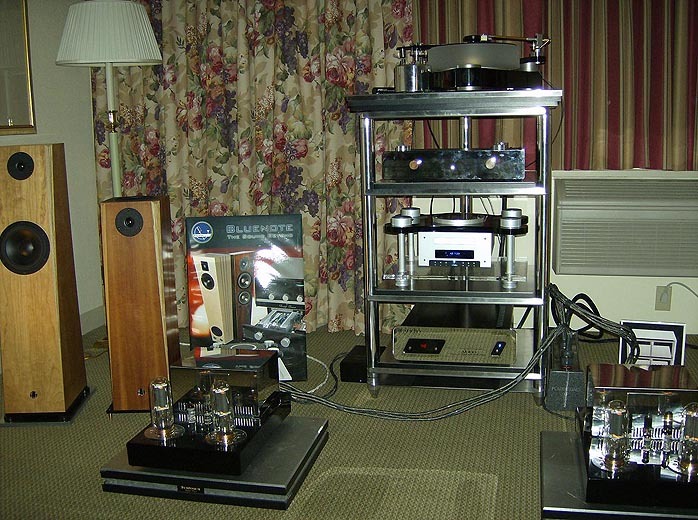 It sounded very real and those tube amplifiers (Art Audio Quartets) were beautiful". Patrick also enjoyed listening to Omega's Max Hemps ($2495), Red Wine Audio's modded Olive music server and Sig 70 monoblocks ($3,995 in teak veneer and matching base courtesy of Omega Loudspeaker's Louis Chocos). It seems Patrick found a kindred spirit in Red Wine's Vinnie Rossi. Both had an animated discussion on computers and various gaming systems. Both Louis and I had no idea what these two geeks were talking about. Then my crafty devil tried cutting a deal with Vinnie for a pair of Sig 70 monos. Vinnie's offer? Get straight As in school and we'll talk. Both Patrick and I got our mojo working with Omega's Max Hemp ($2,495) which sounded great on the Tab Benoit disc I brought. Definitely a speaker for guitar lovers. Also showing in this room was Skylan Stands with their damping boards under Louis' Super XRS ($949). If you spotted a white-haired Irishman wandering about the halls in search of a pint of Guinness, that was Skylan's Noel Nolan. Patrick thought this system was "very easy to listen to. Music was very direct with less stuff in the way and I liked how the guitars sounded. The battery stuff is cool too plus everything is compact so it could fit in my bedroom". Hmmm. Sounds like a not so subtle hint to me. After hearing Patrick's comments, both Louis and Vinnie had the audacity to suggest that Patrick should be writing reviews while I pack it in and take up gardening. 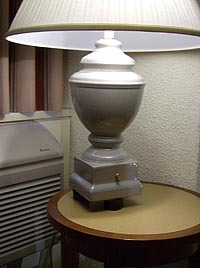 Tucked behind the system was a table lamp sitting on Symposium Rollerblock Jrs. Vinnie and Louis claimed that the light was now more coherent and focused. No doubt Vinni will be offering a modded table lamp in the near future with the aforementioned Rollerblocks, SLA battery powered (of course), hand selected audiophile-grade bulb with 24K gold light bulb filament, 99.999999% pure copper wiring and contact treatments, all encased in a custom wood finish courtesy of Louis. 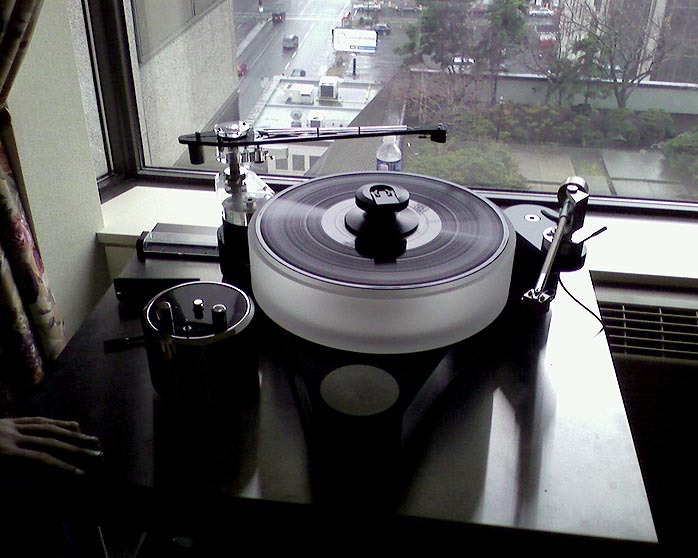 Joking aside, the Rollerblocks really do work especially under CD players and as I recall, were the first ball-bearing footer to enter the audio market several years ago. You might recall poor Dave from Queens from my 2006 Montreal report where I chronicled a late night dinner misadventure with Louis, Noel, Vinnie, Tommy Hills and Wes Bender. Turns out Dave chose to return this year and even brought his girlfriend. He, of course, declined to have dinner with any of us. Dave, I'm glad you decided to give Montreal another chance. Mutine showed in two rooms. 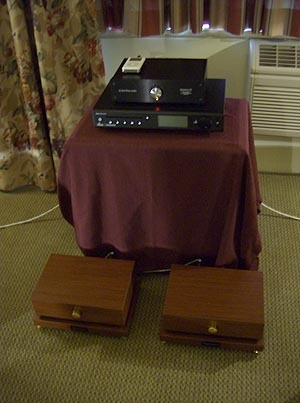 One featured the Mimetism 15.2 (CDN$6,990) 180wpc integrated, 20.1 CD player (CDN$6,990), and the Atlantis Acoustique Argentera (CDN$11,900) loudspeaker while the other sported Equation 35 loudspeakers, Audiomat Recital integrated (CDN$14,900), Audiomat Maestro DAC (CDN$8,590), CEC TL-0X belt-drive transport (CDN$18,900) and Actinote cabling. This room impressed me immensely. Here was a system were music just breathed out effortlessly without any electronic signature. There was certainly a little magic occurring in this room and I could have spent the entire weekend here. Incidentally, Mutine is importing CEC into North America and will also re-start production of the Equation brand of series-crossover equipped loudspeakers here in Canada. 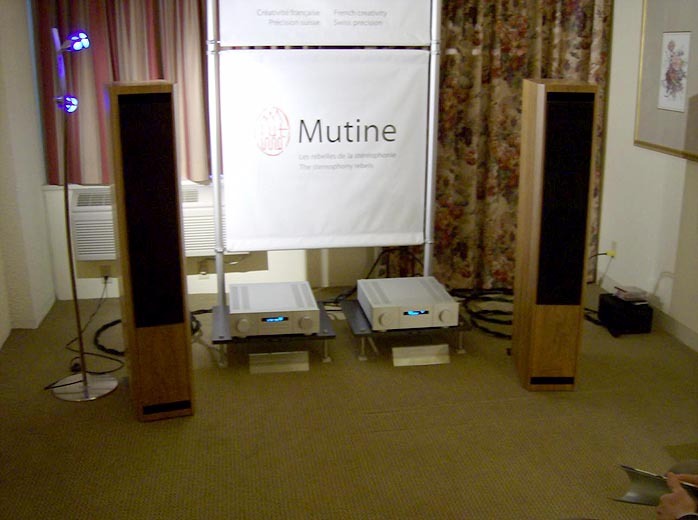 Stay tuned for a Mutine system review in the coming months. 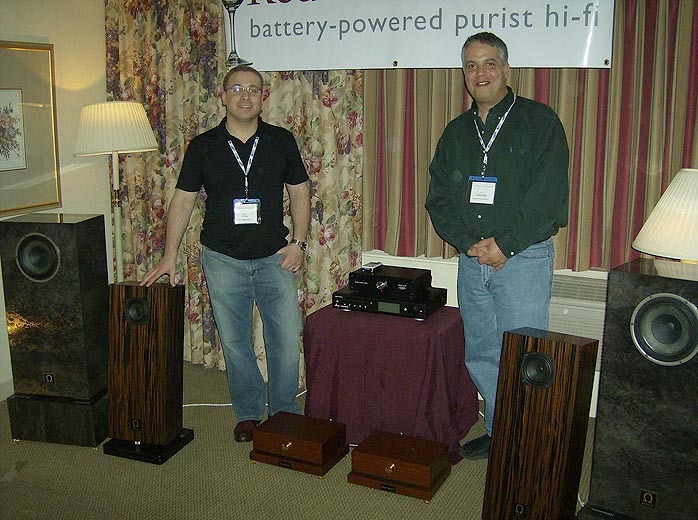 George Tordai and Loren Charles of Audio Zone and Mark & Daniel respectively had showgoers scratching their heads wondering where the subwoofer was hidden. If I had to choose a best bang-for-your-dollar system at the show, I’d nominate this one: M&D Maximus Ruby monitors (CDN$1,825) with Audio Zone AMP-D2 200-watt monos (under CDN$2,000/pr), PRE-A1 active preamp (under CDN$1,500) and Cambridge Audio Azur 840 CD player. Throw in the Maximus stands (CDN$796) and Omni-Harmonizer (CDN$1,025) and you'd have a killer rig for approximately CDN$8,500. In Patrick's words, it was a "sweet" system where he could hear the "ups and the downs" of music. I believe he was referring to dynamic contrasts which were definitely a key trait of this setup. 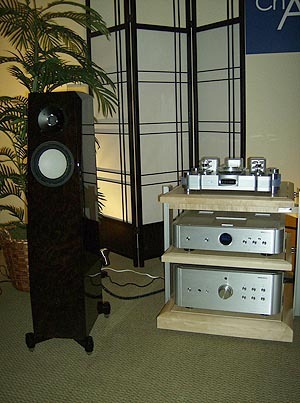 The larger Aragorn Monitors (CDN$7,400 with stands) were also impressive and biamped with a pair of AMP-D1 Class D 100wpc stereo amps (under CDN$2,000). 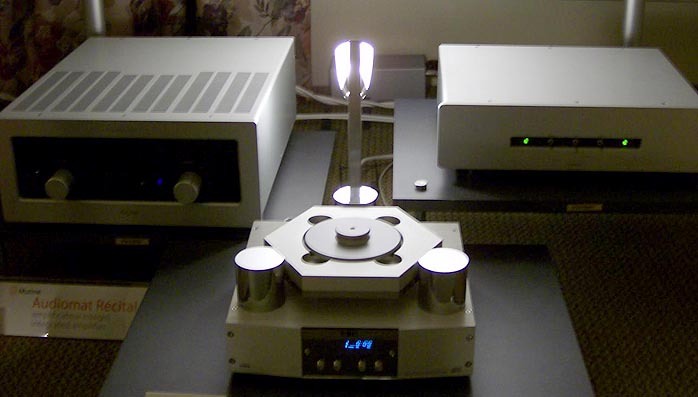 Preamp and sources were the transformer-based passive PRE-T1 ($2,395), NOS DAC-1 ($1,195) and belt -driven CEC TL-51XR CD player (CDN$1,990). Stay tuned for an AZ/MD system review later this year. This room was packed solid with people every time I walked past. Charisma Audio showcased their usual line of JAS and Audio Space gear along with several new products from Shanling: the A500 260-watt integrated amp ($6,499), CD500 CD player ($5,999) with 4 premium grade BB PCM 1704K D/A chips, A300 200wpc integrated (CDN$1,999), CD300 upsampling CD player (CDN$1,899) with BB PCM 1794 D/A chip all sitting on attractive Finite Elemente racks. Also on display was Shanling's MC-30 Music Center (CDN$1,099) which combines a CD player, tuner, tube amp and iPod input into a single chassis and the handsome CD-T1500 (CDN$3,199). 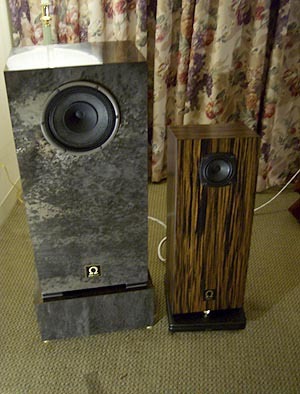 Speakers were JAS Orior Grands (CDN$6,299).